Nimble: Designed with a rotating leg system, the scout walker can be fast when running and has a power regulator for switching between balanced, movement, shielding or weapons. Equipment Storage: SMall compared to other vehicles but with the essentials needed in the field. Overly Engineered: Designed to be fast and nimble with boosters and repulsors for anti-grav support. THe walkers legs have been worked on to be gyroscopic and have a hemisphere rotation below letting the more bubble top pod sit on it and adjust to go over uneven terrain faster. The open cockpit has a lot less protection from attack but it is designed with a shield generator that can be selected and used at the cost of performance and weapons. Overly Engineered: Designed with a power regulator since the scout walker doesn't have a massive generator. It is able to distribute its power around the systems depending on what it needs and cutting out non essential systems to that purpose. WHen it is focused on weapons it might be able to deliver slightly stronger hits but it isn't going to have a protective shield for the open pod or be able to move quickly. If it is focused on shields it can't move or fire its weapons but the pilot will be more protected. Open Canopy: Designed to have less weight so the open cockpit canopy design cuts down on equipment. Allowing the rider to have a full view of everything around them by swiveling their head reducing the overall field of vision for what is in front of them or the edges of their eyesight and leaving them vulnerable to attacks they might not be able to see coming. 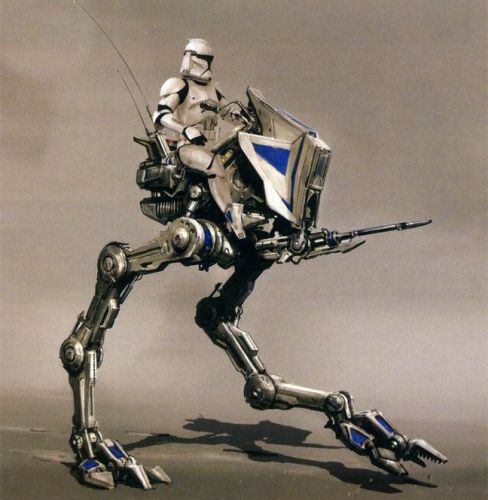 Designed by Saotome as an advanced version of the old model republic scout walker. IT is fast, light and not meant for long term engagements or missions but... it has been improved. A gyroscopic gimble pod that allows the legs around it to rotate and move to the sides and repulsors that can let it move around in a quick thrust.to go over obstacles or uneven terrain . The power systems reworked to be more efficient and instead of running all of its systems at the same time (an option) it can regulate and focus its power to different fields for different purposes. To make it more effective in the field it has a variable turret able to switch between laser and ion shots depending on what might be called for and with the power fully focused on it the small mortor can create and use energy bombs refilling the small reserve off the walkers own power systems. As a scout recon walker it can more quickly normally on its chicken like legs and cover ground. With the power fully focused it can use repulsors to move around and propel itself up to jump over obstructions. The final thing was a shield for the canopy pod. it won't stop a lot but it can be strengthened with additional power to protect the pilot but the weapons and movement would be slow to respond. Over all the scout walker has been given the overly engineered work of the Second fleet to try and make it able to handle scenarios it might not normally be put into or could experience in the field. As opposed to just throwing it in and winging it to see if it can do anything helpful.